Lock in a great price for Ecohotel El Hamaquero – rated 8.4 by recent guests! Food was excellent & owners very friendly & helpful. Wonderful location, with snorkeling right at the property. Clean and friendly staff. All of the staff was accommodating and welcoming. Beautiful spot that is quiet and relaxing, a good spot for travelers looking for a low key place to stay. Beds with mosquito nets, showers and toilets. The food was delicious. Staff was friendly. The environment was very chill. Bora Bora beach club is next door if you prefer a different vibe. Awesome property with all the necessary facilities. Electricity in the room 24h, mosquitiera, large clean bed. Very nice staff! I liked that the property was waterfront and that they had snorkeling gear available for free. Also stand up paddle boards for a small fee. If you like to snorkel this is the best place to stay. 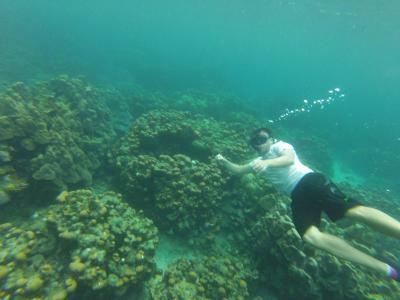 In 2 minute swim you are in a coral garden. There is no beach but when you are aching for sand a 15 min walk takes you to playa Libre. Super clean facilities. Super chill vibe. Very peaceful. Location is exceptional and the staff is extremely friendly and well connected to the island’s community. Basic at it’s best. Amazing experience where you are encouraged to do absolutely nothing and reveal in every second. Snorkelling at sunrise (free equipment of great quality), pots of coffee reading books, sunbathing, kind and thoughtful staff, swimming and ice cold beer. Don’t expect big party scene at night - most people are in bed by 9pm - but I loved every second. Highly recommended. 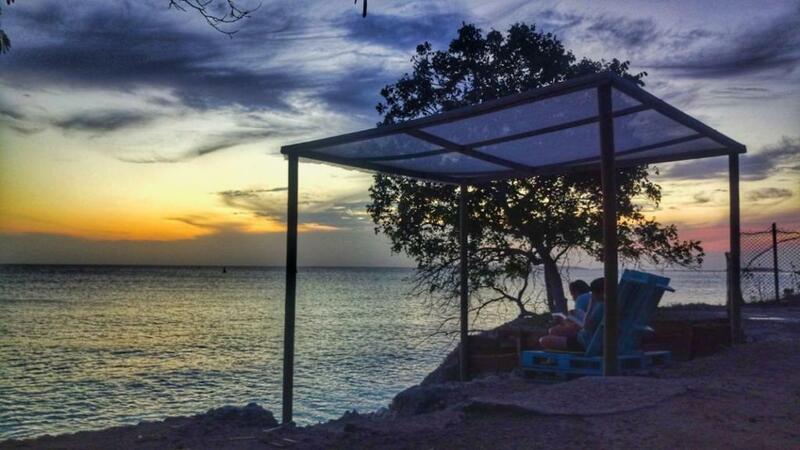 Featuring a beachfront location, free WiFi and a terrace, Ecohotel El Hamaquero offers pet-friendly accommodations in Isla Grande, 22 mi from Cartagena de Indias. Guests can enjoy the on-site restaurant. Bike hire is available at this Ecohotel and the area is popular for snorkeling and diving. Barú is 4.3 mi from Ecohotel El Hamaquero, while Isla del Rosario is 3.1 mi away. This property also has one of the top-rated locations in Isla Grande! Guests are happier about it compared to other properties in the area. This property is also rated for the best value in Isla Grande! Guests are getting more for their money when compared to other properties in this city. When would you like to stay at Ecohotel El Hamaquero? This double room features a balcony and seating area. The private bathroom is located outside the room. House Rules Ecohotel El Hamaquero takes special requests – add in the next step! Up to two children under 12 years are charged COP 70000 per night when using existing beds. All children under 12 years are charged COP 70000 per night for extra beds. Any additional older children or adults are charged COP 75000 per night for extra beds. Ecohotel El Hamaquero accepts these cards and reserves the right to temporarily hold an amount prior to arrival. Please note that WiFi service is available from 8:00 until 10:00 and from 16:00 until 17:00 hours. Please inform Ecohotel El Hamaquero of your expected arrival time in advance. You can use the Special Requests box when booking, or contact the property directly using the contact details in your confirmation. Loved the staff, ocean view, and the food! The staff were extremely friendly and we enjoyed improving on our Spanish with their help. The food was fresh (the seafood especially), and the accommodations were very clean and spacious. Couldn’t have asked for a better stay! All of the staff were really friendly, except for the main guy that walks around with his shirt off all the time. It's not that he was mean, but he seemed a bit arrogant and put out that you would bother him with a request. Other than that everyone was really helpful and seemed very happy to be there. I didn't get the best vibe from other travelers, but I suppose that depends on who is there..
Bugs - we got eaten alive when we forgot to put bug spray on and we’re having a late night dance party on the docks by the water. This is completely all our fault but be warned most places in Colombia you need good bug spray. We couldn’t have enjoyed our stay here more! 5 friends had the best time in the islands, it was just what we were wishing for. The staff are hands down amazing, helpful, so friendly, so accommodating. The beaches... say no more. It’s just stunning and we would all go back in a minute. Took the phosphorescence tour through the mangroves - that’s a must do, spectacular!! We thoroughly enjoyed the island feel, this is not luxurious, it’s rustic and it’s wonderful. We all highly recommend. This was the most expensive hostel on the island. It was absolutely worth it, but maybe the breakfast could be included in the 20$ per night price. Also it is a 20-25 min walk from Playa Libre, which is not that bad, but for those who want a beach, they should account for that. Some of the additional tours that they promote are not good. For example, people get taken on a pricey night kayak ride without life vests! El Hamaquero is an awesome place if you want to detox for a couple days and escape the crowd in Cartagena. The hostel is located on the southwest side, so it has a very nice sunset view which you can enjoy from the swings overlooking the sea. The vibe is that of a family because it is very easy to meet the other guests and chat - everyone gets the happy hour drinks from 6 to 7pm, everyone eats dinner there, and so on. There are mosquito nets on the beds which is really helpful. The island is gorgeous - super safe, quiet, with opportunities for different activities but also great for just chilling in the hammocks on the hostel ground or on the Playa Libre. 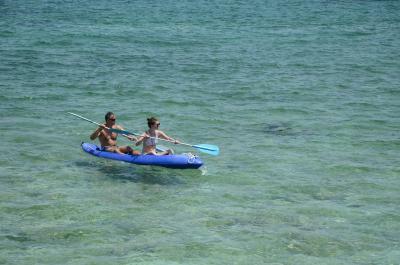 Boats go through coral area most of the day which means snorkeling is not easy. 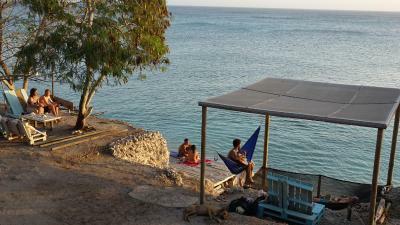 Amazing location, hammocks everywhere, possibility to snorkeling, kayaking. The accomodation's restaurant is 10/10. The barman/"manager" Martín was really very arrogant and downright rude. He seemed to think he was above everyone there, whether guests or even his fellow staff members who he worked with every day. On our arrival, he didn't acknowledge us never mind say hello or welcome, and was patronising when I asked when our room might be ready. He made an error with our booking, which meant we had to spend an hour proving we had booked a room with a view, and didn't show great customer service skills while doing so. One morning, I asked him what he had eaten the night before for dinner, as it smelled great and we were keen to order the same. He sneered at me and replied "A personal meal", as if what he ate was too good for guests (turned out it was the fried chicken on the menu...). His fellow staff members seemed embarrassed by his horrendous attitude towards guests (it was NOT just us who found him difficult). He did not fit with the relaxed environment of the hostel, and we would not return knowing that he was still working at the hostel. El Hamaquero is ideal to chill out and relax. It is basic, but has everything you need for a chilled few days on the island. The surroundings are absolutely beautiful, and the hostel is one of the few places on the island that you can see the sunset. The food is really good, with usual island prices. We had an incredible stay and really enjoyed tours with Philly and Nemo. We had a lovely time 😊 (despite comments made re staff). Staff were very much on 'island time'. You can't drink the water so must buy small bottles at 3000 each, sometimes there were no staff around to get this so I recommend bringing as much as you can over. Restaurant food was ok, food didn't seem very fresh. Dock area to go swimming could do with more sunbeds to relax in, putting a towel down on wood was not comfortable (there is no beach here, you have to walk to another part of the island for that). Dorm room was spacious and comfortable, beds have mosquito nets over them. Lots of hammocks to chill and relax in. Decent place for one night but I was ready to leave after that. Snorkelling gear was free to use. Everything was fine. The only thing was that it took a while for the room to be ready after check in. The place is amazing!! Perfect view, clean, quiet atmosphere. Ecofriendly, they offer information and nice things to do. The restaurant offers good prizes and nice food. This is a wonderful spot to get away...isolated and very basic which is what we were looking for. Very good food and nice but laid back staff who will totally take care of you. Martin the manager is lovely and speaks English. Lots of ocean view lounging areas; chairs, lounge chairs, a hammock, a dock, and a small beach. Free snorkel gear to use and SOP and kayaks to rent. 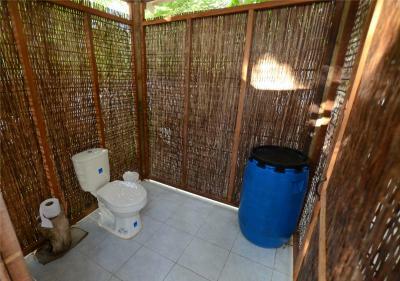 Bathroom facilities are much like a high end outhouse with a cold water only shower. Limited electricity but I was able to charge my phone during day hours and they have wifi. You get to wake up to the sounds of chickens and there are several friendly dogs roaming about. The island itself is just walking paths and seems to have a lot of abandoned properties which we explored. A small local population who are friendly and live very simply. Pigs, goats, chickens and dogs wander freely. There is a couple tiny stores to buy basics at. Not for everyone but perfect for a night for those who love an adventure! Also, the boat ride is an adventure in itself..an hour across rough sea in a small boat loaded with people but hey, we lived to tell about it! The owners are the best, so nice and welcoming. They make you feel at home right away. Hamaquero has a very chill and calm vibe. My friend and I stayed in a shared room and the beds were very comfortable. At night we went on a tour to a laguna where we could see planton light up and the kayak through the mangrove to the laguna was very adventurous. I highly recommend staying at Hamaquero. Isla Grande is expensive and don’t expect it to be very luxurious, but the place is very clean. The Hamaquero is an amazing little eco-hotel on Isla Grande. The sea is absolutely wonderful and there is a private access to it. The managers and staff are very kind and helpful. The dorms are very comfortable with good mattresses, fans and mosquito nets. The food is delicious, everything is home made with fresh ingredients. As it is an eco-hotel, the water is limited but the showers work perfectly. You can snorkel with fishes, rent SUP and kayaks, and even go swimming with bioluminescent planktons! It’s a piece of paradise in Isla Grande! With WiFi in bonus.